Welcome to the latest edition of PHE’s Health Matters, a resource for public health professionals, which brings together important facts, figures and evidence of effective interventions to tackle major public health problems. This edition focuses on getting every adult active every day by building physical activity into daily routines. It couldn’t be timelier as next month sees the eyes of the world turn to Rio for the 2016 Olympic Games. Images of the world’s leading athletes competing for gold will be broadcast across the world. Major sporting events like this can help motivate more people to take part in sport and to start thinking about their own physical activity. But if medals were handed out to the nations with the highest population levels of physical activity then unfortunately England, and Team GB as a whole, would leave empty handed. 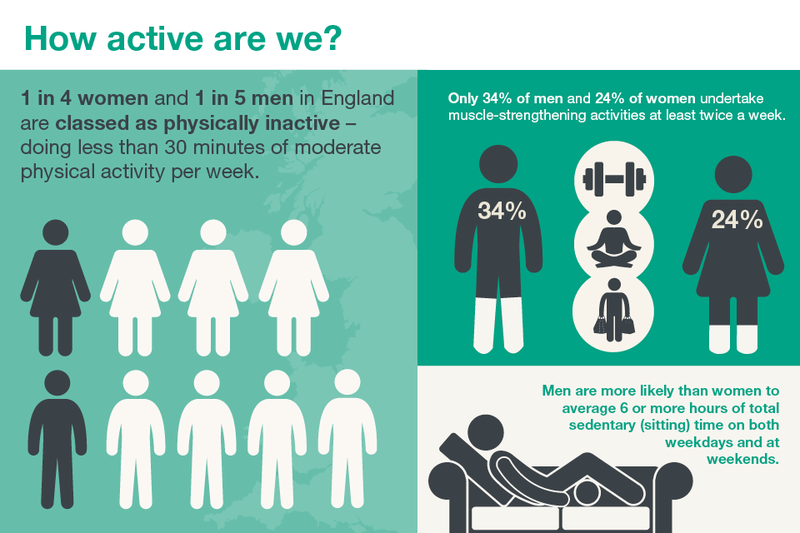 One in four women and one in five men in England are physically inactive, doing less than 30 minutes moderate physical activity a week. This is well below the recommended 150 minutes of moderate physical activity a week, set out in guidelines from the UK Chief Medical Officers. The guidelines also recommend muscle strengthening activities twice a week, but only 34% of men and 24% of women are achieving this. As long as the activity causes you to get warmer and breathe harder and for your heart to beat faster then it counts as moderate physical activity. Any physical activity is better than none. As little as 10 minutes of moderate physical activity at a time provides numerous health benefits. Active Society - People are more likely to be active if it is seen as ‘normal’, and if their friends and peers are also active. Moving professionals - 1 in 4 patients would be more active if advised by a GP or nurse. Active environments - Our homes, workplaces and local environments should be designed to encourage physically active. Moving at scale - Positive change needs to happen at every level, in every region and be measurable. 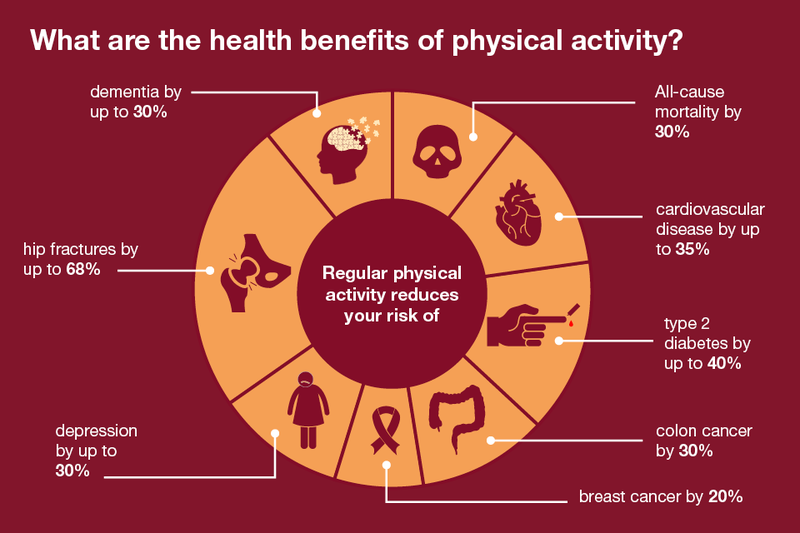 Read the physical activity edition of Health Matters for more on what local authorities and health professionals can do to get the nation active. Gill - you could provide yourself with facilities for exercise at home. I have a rowing machine, but a static bike or a treadmill would work as well. Anybody who has seen the Boat Race, or Olympic Rowers on TV will know that rowers are among the fittest athletes in any sport. Who wouldn’t want to be in that kind of shape? Whilst that aspiration is not realistic for many of us, whatever level you are coming in at, indoor rowing offers a complete exercise for the majority of the major muscle groups in your body.